Mathematical proficiency is essential for every student in Wisconsin. The Wisconsin Standards for Mathematics demonstrate a commitment to high expectations for what students should learn and the instructional shifts that will prepare them for their future. Educators and leaders at all levels must take on the challenge and the responsibility to ensure that all students are mathematically literate. Students should analyze, reason, and communicate ideas effectively as they pose, formulate, interpret, and solve mathematical problems in a variety of situations to ensure success in a world beyond the classroom. Wisconsin’s Guiding Principles for Teaching and Learning provide important guidance for teaching and learning in the classroom. 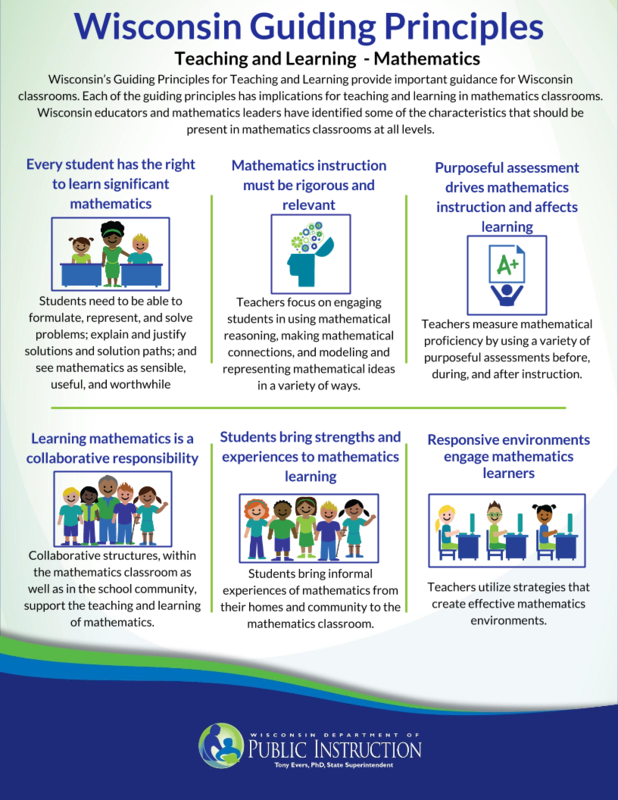 Wisconsin educators and mathematics leaders have identified some of the characteristics that should be present in mathematics classrooms at all levels. Explore WISELearn Resources and find high-quality instructional materials contributed by Wisconsin educators in Mathematics. The WI DPI Mathematics PLC is a space where PK-16 Math educators can engage in a dialogue around practice and research by adding ideas through links, posts, and comments.